Even if your company can afford a fabulous Christmas party, if you are not giving out bonuses, your employees are likely to resent extravagant party expenses, especially if you have given out holiday bonuses in the past and your employees have come to expect them. Whatever you do, do not make the mistake of overspending on a holiday party as a substitute for bonuses. Here are some office party planning tips to keep your employees from becoming disgruntled if they are not getting cash bonuses this year. If you decide to have an office party instead of giving bonuses, promote the party as a way of acknowledging appreciation for the contributions of employees during the past year—not as a substitute for bonuses. Instead, send out an announcement well in advance that your company will not be giving out bonuses this year. Do not relate the party to any communications about bonuses. As soon as you connect the two, employees will feel short-changed, particularly because many employees do not even attend holiday office parties, so they may feel like they received nothing at all. It is fine to state your company cannot afford bonuses this year due to the economy, but never tell employees how lucky they are to even have a job. Instead of focusing on "a year in review" lamenting losses and downsizing operations, use the party as a positive platform to usher in a new, more lucrative year. Talk about hopeful things, new prospects for growth, and a brighter future. Focusing on past hardships will only remind your employees of all the reasons why they are not getting bonuses. Rather than trying to make up for a lack of bonuses with a lavish holiday or year-end party, have a smaller scale party. Your goal is to get employees excited about the party itself and keep their minds off the fact they are not getting a bonus. Over-the-top spending on an office party sends you employees the message that you had excess cash they did not get. Plan a Potluck: Break from traditions and have employees bring some of the food. Make it fun and offer a contest for the best cookie recipe. If you cannot offer a prize, give the winner a work-related perk, an extra paid vacation day. Find Free Entertainment: Invite local church or youth groups to sing or perform—many will do so for free. Even better, if you have musical employees, invite them to perform live music or offer a karaoke machine. Employees will get a bigger kick out of seeing their coworker's band perform than they will if you hire a professional DJ. Include Families: Let families bring the children this year. Many office parties traditionally exclude children, but struggling families may appreciate being allowed to bring their children to your Christmas party. Offer a few holiday activities for kids, like a coloring, cookie decorating, or ornament table so they will have something to take home with them. Acknowledging that your employees have lives outside the workplace by including their families is a great way to help them feel better about your business. 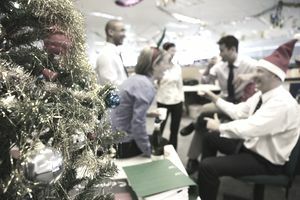 It is often advisable to keep office parties alcohol-free, but if you do allow alcoholic beverages, use an outside service and have a cash bar. If your business cannot afford bonuses, offering an open bar to employees is not a good idea. Additionally, people who have to pay for their own alcohol may drink more responsibly. To avoid legal exposure, have a professional bartender prepare and serve drinks—do not have the company purchase or serve alcohol to employees and never ask or allow employees to bring their own beer, wine, or liquor. The more you involve your employees the more they will appreciate an office party. If the party really is for their benefit, cater to them, not to management.